Chocolate Toffee Pecan Cookies + a Silpat Giveaway! 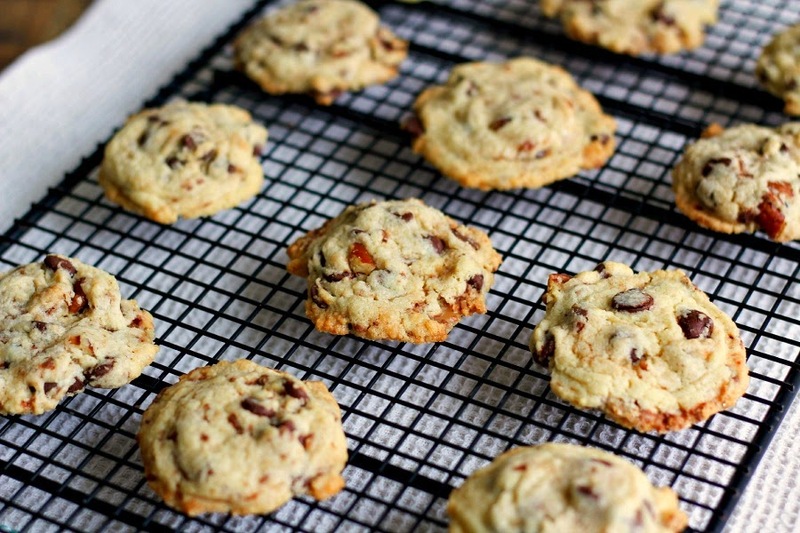 Your favorite chocolate chip cookie gets kicked up a notch with the addition of toffee bits and pecans! I love me some cookies. I mean, who doesn't love cookies? I don't think I've ever met a cookie that I haven't liked! Based on this knowledge I'm sure you can imagine my excitement when I was recently sent a couple of gorgeous Silpat baking mats to test out, one of them being the new Perfect Cookie mat. Welcome to my kitchen you pretty little thang! I never need an excuse to make cookies, but after receiving the Perfect Cookie mat I decided a new recipe should be developed. Because, cookies. Am I right? In this recipe your favorite traditional chocolate chip cookie gets kicked up with the addition of toffee bits and pecans. Two of my all time favorite things. How can you go wrong with such an awesome trio of deliciousness? The new cookies came out fabulously and were quickly devoured by family and friends! I will proudly admit that I am in love with this mat. It shows you exactly where to place your little scoops of dough so that you have the perfectly sized cookies. Here's what they look like after baking. The Silpat mats I received have to be one of my favorite tools in the kitchen. Non-stick, easy to clean, and they last forever. What's not to love? Wanna know something else really fun and exciting? 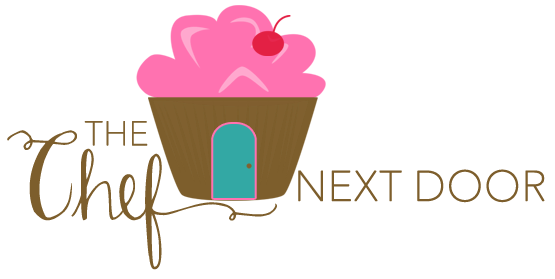 Silpat is offering a giveaway to my readers...one lucky winner will receive a classic Silpat mat AND the new Perfect Cookie mat! How awesome is that? 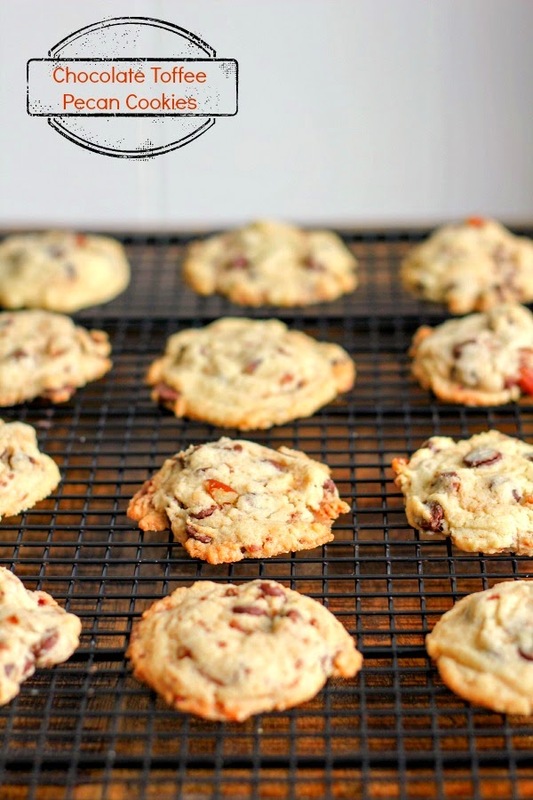 Get the recipe below for these amazing Chocolate Toffee Pecan Cookies and then enter to win your very own Silpat Baking Mats! Good luck! Preheat the oven to 350 degrees. Line a baking sheet with a Silpat and set aside. In the bowl of a stand mixer, beat the butter and both sugars until light and fluffy. Add in the eggs, one at a time, beating well after each addition, then the vanilla. In a large bowl whisk together the flour, baking soda and salt. Add it to the mixer, about a half cup at a time. Stir in chocolate pieces, toffee pieces, and pecans. Using a cookie scoop, drop balls of dough onto the prepared cookie sheet. 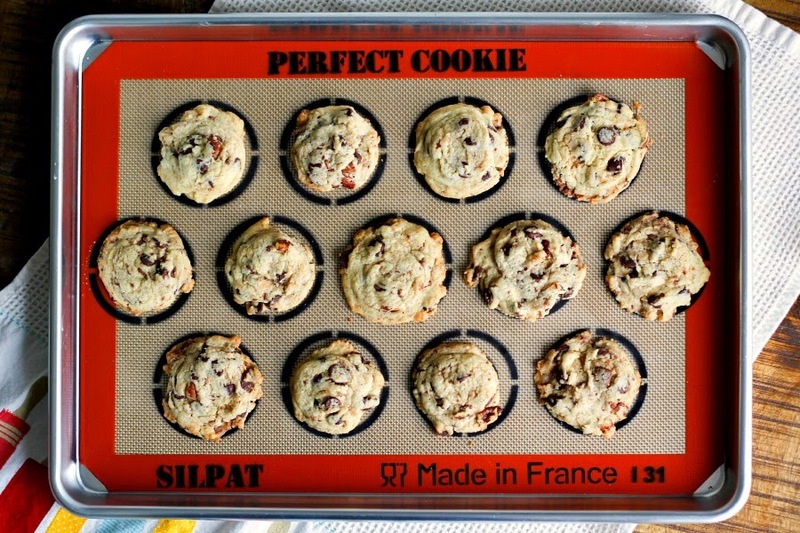 If using the Silpat Perfect Cookie Baking Sheet, place the balls in the center rings. Bake the cookies for 10 to 12 minutes, or until the cookies are set and the edges are light brown. Allow the cookies to cool on the cookie sheet for a few minutes before transferring them to a wire rack to cool completely. Disclaimer: I received products from Silpat for review at no charge but was not monetarily compensated for this review. All opinions, as always, are my own. Giveaway open to legal residents of USA who are 18 years and older or older. Void where prohibited or restricted by law. Sponsor and their respective parents, subsidiaries, affiliates, distributors, retailers, sales representatives, advertising and promotion agencies and each of their respective officers, directors and employees (collectively, the "Promotion Entities"), and members of their immediate families and/or persons living in the same household as such persons, are ineligible to enter the Sweepstakes or win a prize.